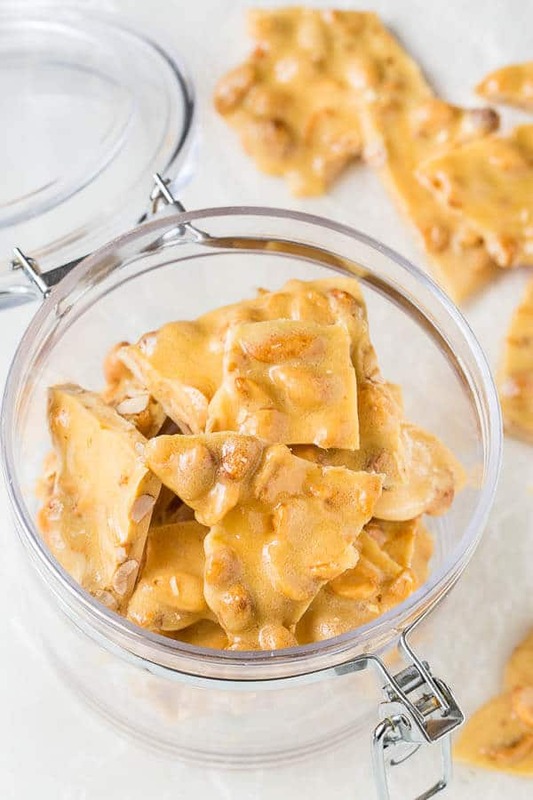 No candy thermometer is required for this no hassle microwave peanut brittle candy recipe. And it takes only 10 minutes of hands-on time. It can’t get easier than this! My mother-in-law’s friend, Leo, makes the most addicting peanut brittles that I’ve ever had! It’s sweet and nutty, melt-in-your-mouth crunchy. I don’t know if that last part make any sense at all, but it basically means it’s not rock hard, or stick-to-your-teeth chewy that you’d pray not to lose a teeth while eating it. No, nothing like that. 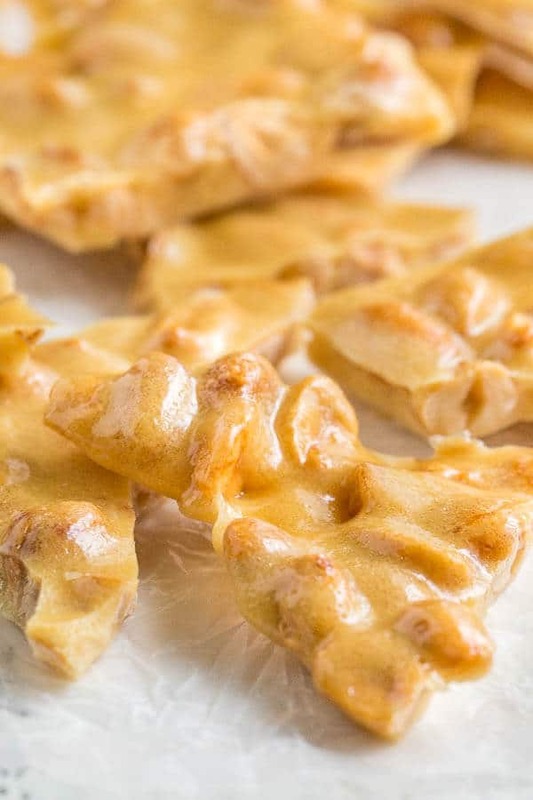 Instead this peanut brittle has light and airy texture with the most satisfying crunch. Every Christmas my MIL shares her bag of treats from Leo with me, because she knows how much I love them. Well, this past January she brought yet another bag full of amazing brittles for me and my mom. My mom loved those brittles so much so she insisted me to call Leo for the recipe, and I obliged. Don’t know why it took me so long, but I’m so glad I did. And today I’m going to show you how to make the easiest and most addicting candy ever. Ready? 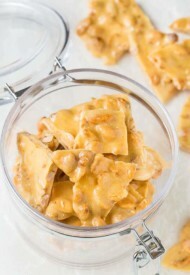 As I said earlier, these are the easiest peanut brittles in the world! No exaggeration here, because 1. You don’t need candy thermometer. 2. No stirring sugar mixture over hot stovetop for a long time. 3. It only takes 10 minutes of hands on time, one bowl with a lid, a microwave, and handful of simple ingredients. Prepare and measure out all the ingredients before starting. The process goes super quick and you want that margarin, that baking soda right now! Speaking of margarin. Yes, you do need margarin. And no, you can’t use butter, I tried it to no avail. (<- I got rock hard brittles!) I gave in and bought a package of margarin just for this recipe, but it’s so worth it. Microwave-safe bowl with a lid is essential. Leo stressed that the bowl has to have a lid, or you’ll risk burning the mixture. Baking soda is what makes the candy so airy and light. After mixing in soda, the mixture will foam up. Don’t be alarmed, because it’s a good thing. Don’t take too much time mixing though, just a few good stirs until the mixture is evenly foamed up and pour it on a buttered baking sheet. I use 2 forks to spread it out evenly, but not too thin. Directions on timing in this recipe are for 1000Watt microwave. I now know the recipe by heart, as I’ve made countless batches to feed my mom’s craving. I even sent some to my sisters back in Mongolia, and they all loved it. Well, I mean, what’s not to love here?? Hope you give this fool-proof recipe a try. 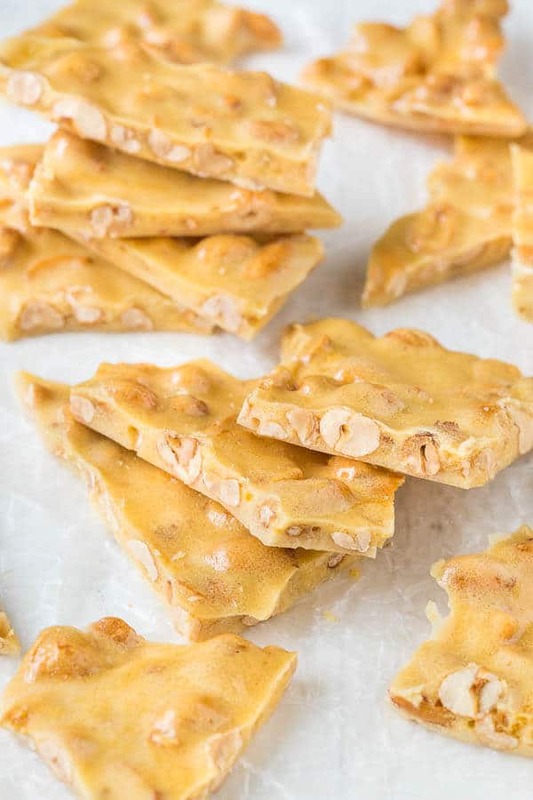 No candy thermometer is required for this no hassle microwave peanut brittle candy recipe. It takes only 10 minutes of hands-on time. It can’t get easier than this! First check your microwave power. (Mine was written at front when you open the door.) The time directions in this recipe for microwaves with 1000Watts. Prepare a baking sheet and spray with non-stick spray. In 1-quart microwave-safe bowl with a lid (stay away from plastic container though, I prefer a glass bowl), combine peanuts, sugar, salt and corn syrup. For video directions and additional notes, read the post above. This recipes is from family friend, Leo.